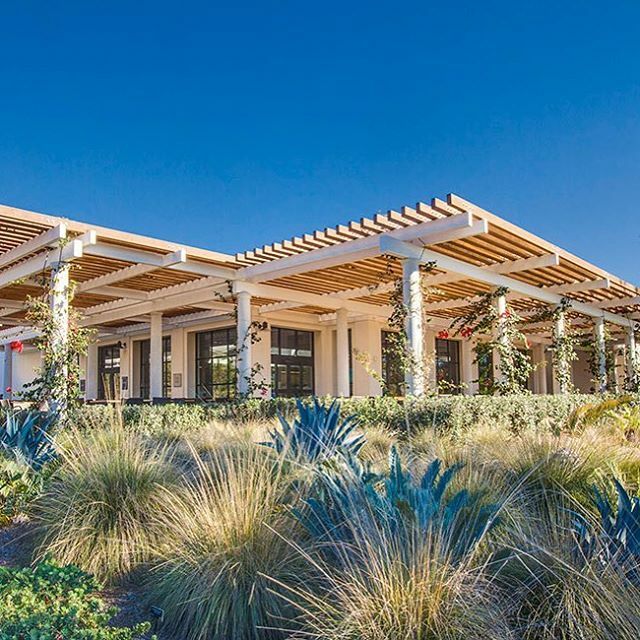 Who: Thanks to the Border Grill co-founders and Kajsa Alger of Blue Window, who took over the food program at The Huntington Gardens in November of 2016, you can now have your garden views and eat like a foodie with them too. 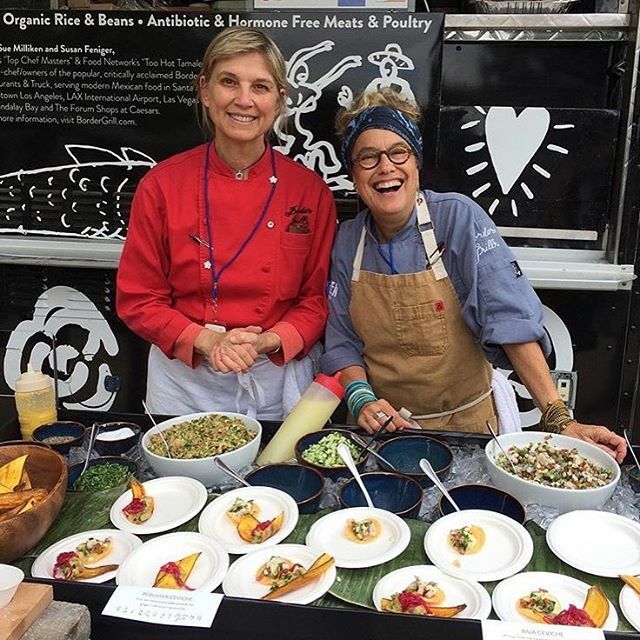 In celebration of their success in uplifting the outdoor oasis into a dining destination, Mary Sue Miliken and Susan Feniger of Border Grill call out their top picks on where else to dine al fresco in Los Angeles. Mary Sue Milliken (L) and Susan Feniger (R) at the The Huntington Library. Image courtesy of @bordergrill. 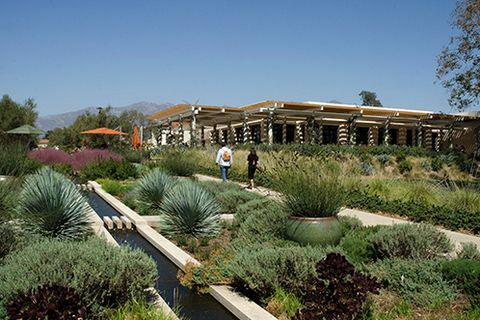 Susan Feniger: The Huntington Library tops the list as it’s one of the most beautiful places in all of California. You really have to come very hungry in order to take advantage of all the amazing eats! 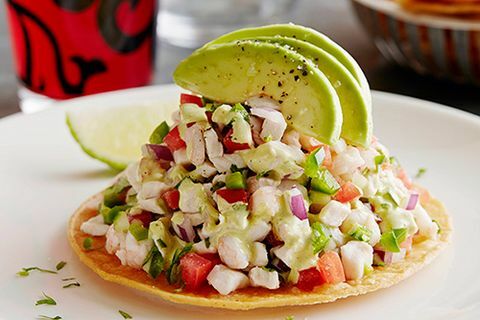 The new Border Grill Taqueria inside Café 1919 has handmade tacos and a ceviche duo that is perfect for a patio lunch gazing out at the Orbit Pavilion silver sphere and gardens. General Tso’s Cauliflower from the Freshwater Dumpling and Noodle House is the perfect late afternoon snack in the Chinese garden and the view overlooking the pond is exquisite. On weekends the Patio Grill is a great place to hang with the family and have freshly grilled treats, sandwiches and salads. And if you can plan ahead, the high tea in the tea room is an amazing way to take a break on your long and winding stroll through the grounds. 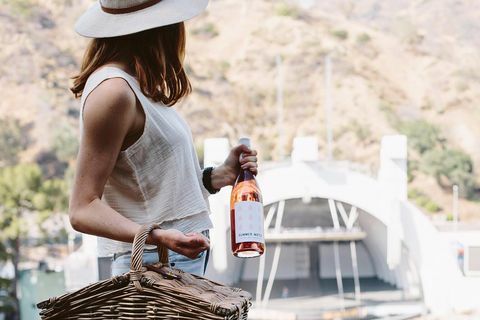 Mary Sue Milliken: The Hollywood Bowl is better than ever! Nothing beats sitting outside in that canyon listening to beautiful music and eating Suzanne Goin’s summer picnic fare. 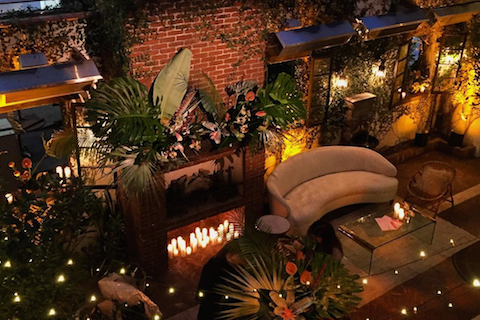 SF: AOC’s patio is pretty romantic and of course the food is always, always amazing. Suzanne is a fantastic chef and so you almost feel like you might be in Italy, or Northern California or somewhere on the Mediterranean, hanging out, drinking delicious interesting wine and eating yummy food. 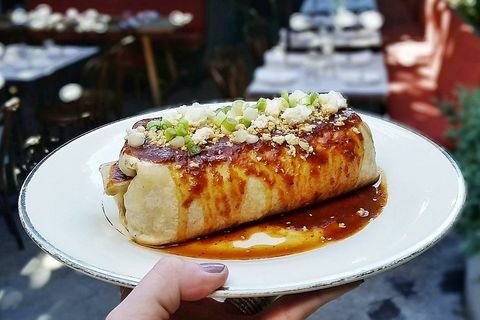 MSM: Pick up Madcapra’s “go Big” tasting menu at Grand Central Market and sit out on Broadway after a bike ride around the city and you’ll forget you’re in LA--- it’s like a vacation in a big, grown up, city! 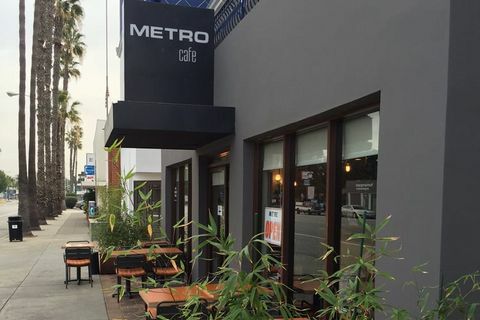 MSM: Metro Café has Serbian specials and a nice selection of wine that Sasa, the owner, loves to get you tasting. Sitting out on Washington Blvd while enjoying Bernie’s big salads and a bowl of mussels or grilled chevapchichi with Serbian salad is the best. 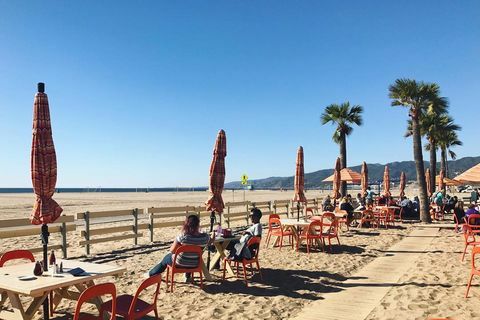 SF: Back on the Beach is the perfect Santa Monica eating place. 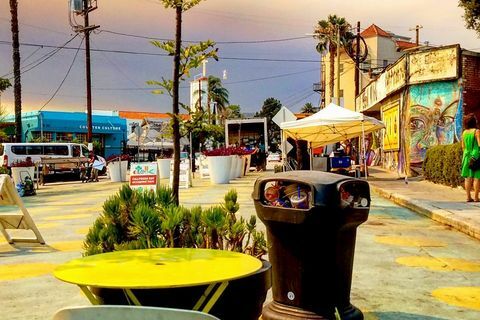 You can put your feet in the sand, watch the bikers, walkers, kids, ocean and eat yummy food. And love the owner, Fred Deni, he’s always there. MSM: Pine & Crane has great fresh Taiwanese flavors and lots of vegetables from the farm. 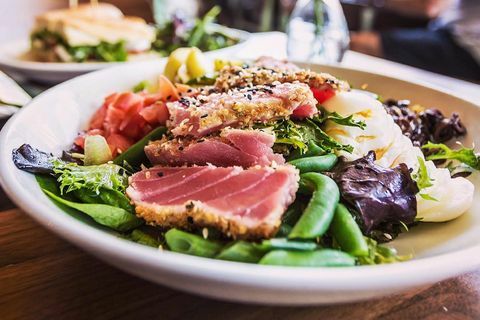 We always start with the spicy peanuts and sea salt black milk tea, then get lots of small plates and grab a table out on the Sunset Triangle Plaza patio. MSM: Sitting outside for brunch is a favorite and Terrine has an awesome menu and a patio. Kris Morningstar changes it up and offers everything from ancient grains with poached eggs to pickle brined fried chicken and grits. SF: Coral Tree is my go to when it’s cold and rainy out. There’s a great firepit outside, heat lamps and it feels cozy and comfy. The food is interesting and healthy, delicious teas and coffees, and a great late afternoon spot to just read and grab a bite. 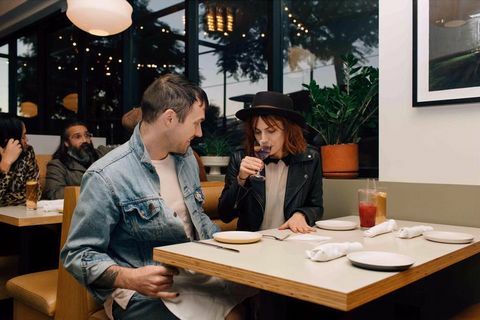 MSM: Winsome in Echo park has a great patio and an exciting, crowd-pleasing menu … from roasted bone marrow to crispy tofu to duck egg toast. MSM: Mare on Melrose for a dinner under the stars is incredible. Love the mussels or clams and salt roasted potatoes. 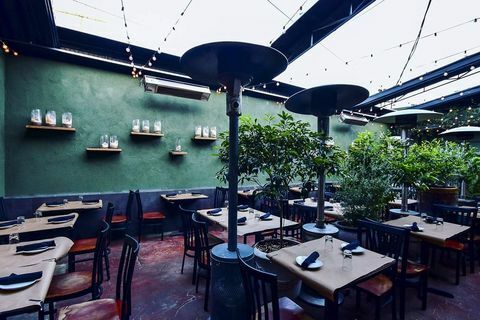 Image courtesy of Justin M.
Eye-catching eatery with a courtyard furnishes premium Californian-French small plates & fine wines. Counter-serve spot inside Grand Central Market for farm-to-table falafel sandwiches & unique drinks. LOCATION CLOSED - Relocated to 2609 Hyperion Ave, Los Angeles, CA 90027. Modern spot with outdoor seating offers a creative menu of New American comfort food. Seasonal Californian cuisine with both indoor & beach seating offering ocean & island views. In the Chinese Garden, innovative chefs Kajsa Alger and Susan Feniger (of Blue Window fame) offer authentic dumplings and noodle dishes drawn from the many regions of China as well as from surrounding influences such as Nepal and Mongolia at this affordable café in the Freshwater Pavilion. Choose from a variety of beverages, including tea or craft beer, to enjoy with your meal. Creative takes on traditional Mexican fare & fun cocktails are served in a high-energy space. Breakfast plus American comfort foods served all day in a stylized barn or outdoors. 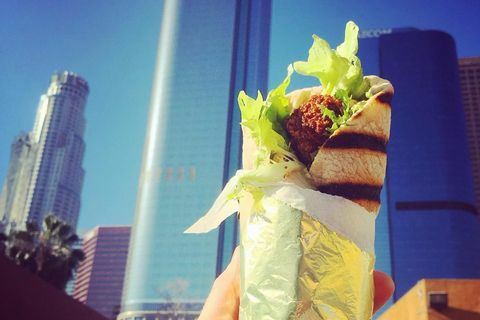 CLOSED - Gourmet comfort-food entrees for a set price can all be made vegan at this modern takeout spot.